Our meeting place in the heart of Oxford couldn’t have been more apt – in the book-lined basement (affectionately referred to as “the Bunker”) of the maverick Albion Beatnik Bookshop. The walls are painted with words, and the ceiling is papered in printed pages of books, so we were totally immersed. I am kicking myself now for not taking photos, but the talk was so absorbing that I completely forgot. We’d had the good fortune to be introduced to Edmund by his wife Clare, who writes novels under the pen-name Mari Howard. 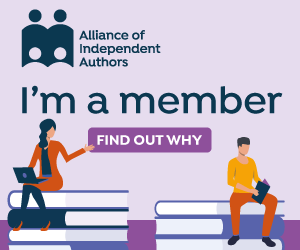 She is a member of both the Oxford Authors Alliance and the global Alliance of Independent Authors (of whose Self-publishing Advice blog I’m Commissioning Editor). She’s also a regular Hawkesbury Upton Literature Festival author, where she has given readings of both her prose and poetry and taken part in lively panel discussions. Edmund has always come along to support her and enjoy the Festival, and it’s been a pleasure to have him open up now about his own important work with the basic components of the author’s craft: words. Edmund is what’s known as a historical lexicographer, defining words by tracing their origins and history and cataloging their changing use as time goes by, because, as he pointed out, our language is constantly evolving. This fact makes him reassuringly dismissive of any notions of rights and wrongs in its use. Of course, in the early days of dictionaries (with which most of us are chiefly familiar from the episode of Blackadder III in which Baldrick uses Samuel Johnson‘s only draft of his first dictionary to light the fire) everything was done by hand and on paper. These days, records are all online, which provides an endless canvas for our endlessly expanding language: 600,000 words and counting, and no word is ever removed. No, not THAT sort of toilet water! Apparently anyone with a library card may access the OED online free of charge (another great reason to support your local public library), but there are also some public pages freely available that, now I’ve discovered them, I expect to prove highly addictive. One of the highlights of Edmund’s fascinating talk last night was when he read to us his essay on the descent of the word “toilet” – particularly helpful to me as I recently struggled to answer my daughter’s question as to why anyone would want to splash “toilet water” on themselves. I’m hoping we’ll hear more from Edmund Weiner about our fascinating language at a future Hawkesbury Upton Literature Festival – watch this space! With thanks to Edmund Weiner, Clare Weiner/Mari Howard, the Albion Beatnik Bookshop, and Oxford Authors Alliance organiser Lynne Pardoe, who, by the way, has just launched her second novel in her series about social work, Abandoned by My Mum, now available as an ebook via Amazon for just £2.25). Reblogged this on Mari Howard, Author. Wow. Twenty-three years in and only 30% complete. That is what you call an epic project.